Sorry, this item is currently unavailable. Please consider purchasing Aspire Hayfever Relief Eye Drops (10ml) instead. Price: £6.20 (incl VAT) Sorry, this item is currently unavailable. Please consider purchasing Aspire Hayfever Relief Eye Drops (10ml) instead. 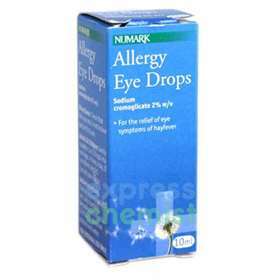 Numark Allergy Eye Drops - Sodium cromoglicate 2% w/v. For the relief of eye symptoms of hayfever such as itchiness and burning. Directions for Use: Check that the cap seal is not broken before first use. Gently squeeze 1 or 2 drops into each eye, 4 times a day. If symptoms persist, consult your doctor. SODIUM CROMOGLICATE, BENZALKONIUM CHLORIDE, DISODIUM EDETATE AND WATER. DO NOT USE WHILST WEARING SOFT CONTACT LENSES. CONSULT YOUR DOCTOR BEFORE USING THIS PRODUCT IF YOU ARE PREGNANT OR BREAST FEEDING. Product code: 1108356 Price: £6.20 (incl VAT) Sorry, this item is currently unavailable. Please consider purchasing Aspire Hayfever Relief Eye Drops (10ml) instead.